this bug appeared from when i started using texture packs and i also used the new minecraft texture pack with the texture pack i used together. 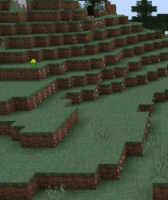 and then i noticed that the grass and water displaying weird wavy lines and blocks have white edges. i recently uninstalled minecraft and downloaded it again. but that didn't help its still as it looked before. I tried removing the new minecraft texture pack and loading the world but it didn't work I also removed the resource pack as well. I looked up on YouTube about this bug and I found a solution. All you have to do is to turn off the Anti-aliasing settings in your Nividia control panel, If you don’t have Nividia then I suggest looking up videos to help you out with non-nividia users.